The economist who predicted the 2008 financial crash has warned American politicians that Bitcoin is “the mother of all scams” during a Senate hearing on cryptocurrency. Nouriel Roubini, a fierce critic of virtual currency, took aim at the blockchain technology underpinning cryptocurrency, which is often hailed as transformative even by those cynical about digital coins. “Blockchain is the most over-hyped technology ever,” the New York University Professor told the Senate Banking Committee. “It is nothing better than a glorified spreadsheet or database. "It is clear by now that Bitcoin and other cryptocurrencies represent the mother of all bubbles," he added. The attack contradicts proponents of blockchain including the Government's science office, which argued in 2016 that the technology could “help governments to collect taxes, deliver benefits, issue passports, record land registries, assure the supply chain of goods and services and generally ensure the integrity of government records and services. ” Roubini added that the nickname “s---coins" which is often used by cryptocurrency traders when referring to less valuable coins, was “a grave insult to manure”. His scathing attack came as the cryptocurrency market took a battering off the back of tumbling global stock markets. Bitcoin dropped as much as 6.9pc to $6,080, its lowest point in two months. At its peak late last year Bitcoin was worth $20,000. Traders claim Bitcoin's selling point is that its decentralised nature leaves it immune from stock market volatility, acting more like a "digital gold". But it appears that as the coin went mainstream, traditional investors are using traditional equity strategies, suggesting the crypto market could dip further if the stock markets continues downward, likes its fiat counterparts. Industry champions were keen to paste over the cracks, with market analyst at cryptocurrency exchange platform eToro, Matt Newton sending out an email to assure that the fall was “a sign that the markets are working” and that “much of the ‘good news’ is currently happening behind the scenes”. Governments are mulling whether to step in and regulate cryptocurrencies, which critics claim are vehicles for scams and money laundering. China has already banned domestic exchanges and well as Initial Coin Offerings (ICOs), a form of crowdfunding. The US securities watchdog on Thursday halted an ICO which falsely claimed it had approval from the Securities and Exchanges Commission. Francisco Gimeno - BC Analyst Roubini attacks to blockchain and cryptocurrency are more and more pathetic by the day. He feeds the interests of panicked banksters and lobbies which want to remain holding the financial power against the new incoming economy. This article also doesn't talk about the answers of Mr. Peter Van Valkenburgh who demolished Roubini points one by one. Francisco Gimeno - BC Analyst USA Congress is yet very much behind on their understanding of cryptocurrency (and Blockchain in general). 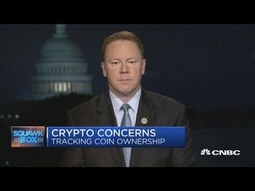 This Congressman is right (although the interviewer shows also a lot of ignorance, btw, when he talks about BTC and illicit uses of crypto). Congress however should avoid the temptation to overregulate. Crypto means money out of the Banks and in hands of people, and means a whole financial and economic revolution. Do they understand that? Bitcoin touched below $6,000 and dozens of smaller digital tokens including Ether retreated as this month’s sell-off in cryptocurrencies showed few signs of letting up. The largest digital currency fell as much as 6.2 percent to $5,887, the lowest level since June, before paring some of the drop, according to Bloomberg composite pricing. Ether sank as much as 13 percent, while all but one of the 100 biggest cryptocurrencies tracked by Coinmarketcap.com recorded declines over the past 24 hours. The total market capitalization of virtual currencies dropped to $193 billion. That’s down from a peak of about $835 billion in January. “The big story in the market today is the huge weakness in Ethereum,” Timothy Tam, chief executive officer of CoinFi, a cryptocurrency data analysis company, said in a phone interview. “Bitcoin has held up relatively well versus Ethereum. It’s still quite weak versus the U.S. dollar. 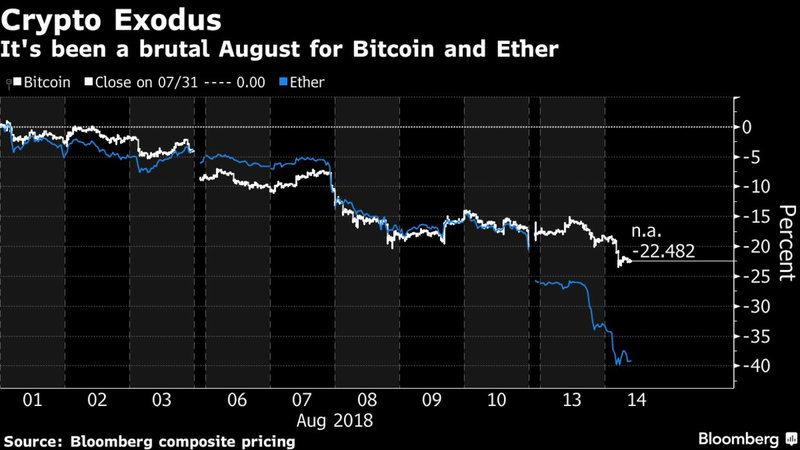 ”At the height of Ether’s rally last year, the digital coin comprised 32 percent of cryptocurrency market capitalization, coming within striking distance of Bitcoin’s 39 percent. Ether now makes up about 14 percent, while Bitcoin accounts for 54 percent after falling less quickly than its smaller peers, according to Coinmarketcap.com. “ICOs that have raised a lot of money are really feeling a lot of pain” as their crypto holdings lose value, Tam said.Ether has tumbled about 40 percent this month, while Bitcoin has dropped about 26 percent.It’s unlikely that recent global market turbulence, fueled by Turkey’s currency crisis, is impacting cryptocurrencies, said James Quinn, head of markets at Kenetic, a blockchain company with investment and advisory businesses. “Correlations historically have been extremely low between cryptocurrencies and other asset classes,” he said in a phone interview from Hong Kong. “Which is one of the reasons why there is interest in this space and why people want to make an allocation in this space. ”Still, anyone expecting Bitcoin to provide a haven from turbulence in global markets will have been disappointed. The cryptocurrency’s slide against the dollar this month is almost as big as the Turkish lira’s 25 percent slump. Exchange-traded funds (ETFs) are among the hottest modes of investment today, with investors pouring trillions of dollars into an ever-growing field of funds. Particularly in comparison with high-fee hedge funds (many of which have failed to live up to expectations on returns in recent years), low-fee ETFs provide a safer, more stable means of investing that has proven enticing for many investors. One of the wonderful things about ETFs is that they are infinitely broad in scope and focus; investors can use ETFs to participate (by proxy) in markets ranging from energy to marijuana. So why haven't cryptocurrency-based ETFs taken off so far?Cryptocurrencies have been another of the hottest trends in the investment world in the past couple of years. Following the lead of breakout stars like bitcoin and ethereum, digital tokens have proliferated at an astonishing pace. Some of the most successful cryptocurrencies have seen outlandish gains. However, the industry is full of uncertainty and plagued by heavy volatility. "For this reason, many investors would prefer to use a vehicle like an ETF to participate in the cryptocurrency space. In this way, they could take advantage of the excellent opportunities that tokens present without having to run the risk of actually owning them. Given that cryptocurrencies and digital token exchanges are still regularly the targets of thieves and scammers, it's understandable why investors might wish to take this extra precaution. A cryptocurrency ETF works, in theory, like any other ETF. While most ETFs track an index or a basket of assets, a cryptocurrency ETF would track one or more digital tokens. Like other ETFs, digital token ETFs would trade like common stocks on an exchange, and they would be subject to changes in price throughout the day as investors buy and sell.In order for a cryptocurrency ETF to work properly, it will need to own the underlying assets that it tracks; the ETF would have to own a commensurate stake of digital tokens. The ownership of these tokens would be divided into shares, and investors in the ETF would indirectly own those tokens. ETF investors would then receive a proportion of the profits generated by those underlying assets. There are many benefits to a cryptocurrency ETF over a straight-up cryptocurrency investment. First, as indicated above, digital wallets and exchanges are highly susceptible to hacks and thefts. Investors holding digital tokens run the risk of seeing their assets disappear on them with little recourse. An investor in a digital currency ETF, however, has an added layer of security in the custodian bank that supports the ETF. (For more, see: ETFs Can Be Safe Investments, If Used Correctly. )Another benefit of a cryptocurrency ETF is that it can be used to track multiple digital tokens at once. The cryptocurrency world is highly compartmentalized, and investors looking to hold a basket of, say, 20 different tokens may have to own and operate multiple wallets and accounts across various digital currency exchanges. Very quickly, the process of investing in these tokens and trading regularly becomes one that is perhaps not worth the amount of administrative time and effort required. A cryptocurrency ETF could take out much of the time and hassle for investors by simply tracking those same 20 tokens. Investors could then buy and sell shares of the ETF to gain the same exposure to that pool of tokens without having to worry about individually managing each of them. As of this writing, there are no cryptocurrency ETFs currently listed for trade in the United States. The closest is a fund known as the Bitcoin Investment Trust (GBTC). This trust acts like an ETF in many ways; it owns bitcoins on the behalf of investors and allows them to trade in shares of the trust. However, the sponsor of the fund, Grayscale Investment Trust, charges annual management fees of 2% of the fund's assets, a price point significantly higher than most other ETFs. The Chicago Board Options Exchange (CBOE), which launched bitcoin futures late last year, has lobbied the SEC to reconsider its earlier blockage of digital token funds. Cameron and Tyler Winklevoss, the founders of popular digital currency exchange Gemini, have twice petitioned the SEC to approve a bitcoin ETF; each attempt has so far been unsuccessful. Coinbase, another immensely popular digital currency exchange, launched an index fund offering exposure to four of the largest digital currencies, but that again is not quite the same as an ETF. Some ETFs even offer small exposure to GBTC, but these are not strictly focused on cryptocurrencies. (For more, see: SEC Rejects Winklevoss Bitcoin ETF Plans. )The SEC has indicated its openness to the possibility of cryptocurrency funds in the future, and this could perhaps continue to fuel investor optimism if cryptocurrency ETFs thrive in other parts of the world. Various markets in Europe and Asia, for instance, have introduced cryptocurrency ETFs thanks to differing levels of regulation. For the time being, though, U.S. investors will have to wait. U.S. investors looking to take part in digital currency ETFs have limited options. If they have access to international ETFs, that is one approach. If they meet the stringent requirements for investing in GBTC, they can do that as well. For the time being, though, these investors may be best off looking toward a related group of ETFs: blockchain funds. (See also: What Is the Difference Between Blockchain ETFs and Bitcoin ETFs? )Blockchain technology supports the cryptocurrency space and is closely linked with digital tokens. There are a growing number of ETFs focused on blockchain-related companies.
) allow investors access to companies that focus on the blockchain space. Many of these ETFs have seen immense success already. While it's far from a sure thing, many cryptocurrency enthusiasts see it as only a matter of time before the SEC approves digital currency ETFs. If and when this happens, it's sure to have a significant impact on the performance of the cryptocurrency space itself. Earlier this year, the SEC opened up its consideration of two different digital currency ETFs for public comment. While it has yet to go so far as to approve a cryptocurrency ETF, that day may be approaching. Ethereum aims to be a global computing platform, but investors like Tetras and Hidden Hand are concerned that its $48 billion market cap isn’t justified, largely because the network can only handle about 15 transactions per second. By contrast, Visa can handle 24,000 transactions per second. “Ethereum has an incredible talent pool of developers,” Young says. “In the long term, I think they’ll solve a lot of scaling challenges. But in the short term, there’s a disconnect between the price and underlying technology.” Sunnarborg agrees, saying, “Just because something is a good idea doesn’t mean it’s a good investment. ”Ethereum isn’t controlled by a single company, and decentralized applications (DApps) run on top of it. None of these apps have more than 5,000 daily active users, yet the network is nearly at full capacity. Network congestion can cause the fees required to use the platform to skyrocket. For example, to perform a simple step in the Ethereum-based game CryptoKitties, where users can create digital memorabilia, it might cost $3. Those costs rose higher than $20 at the end of 2017. “An application call can be roughly 1 million times as expensive on Ethereum as compared to a centralized service like AWS [Amazon Web Services],” Tetras wrote in its report. Jake Brukhman, founder of Brooklyn-based crypto asset manager CoinFund, disagrees. He has been holding ether since July 2015, and the asset has historically made up between 20% and 42% of his firm’s first fund. Among Ethereum's nearer-term scaling solutions like “state channels,” which allow transactions to happen more quickly, off the Ethereum blockchain, “a ton of improvements are coming to market this year,” Brukhman says. “As a blockchain technology, Ethereum still remains the largest ecosystem of technologies, tools and developers. ”Some data suggests that few investors are closely monitoring Ethereum’s technological progress. Casper and Plasma are two technical updates that will help speed up Ethereum transactions. “Casper and Plasma publish their meetings, and they still have less than a few hundred views on YouTube,” Young says. “I don't think most people are either taking the time or have the technical background to really understand. ”Other big-name investors are on the fence about ether. Kyle Samani, managing partner at Multicoin Capital, says he’s “seriously considering” shorting it, but is already betting against ripple and litecoin and isn’t ready to add more short exposure. Longtime crypto investor and CoinShares chief strategy officer Meltem Demirors is “neutral” on ether. “We are nowhere near a bear market yet,” she says, although she thinks demand for Ethereum-based tokens and applications is largely speculative. “In the absence of more Enterprise Ethereum Alliance announcements in 2018, I won’t look to add more exposure. ”Tetras goes into many other reasons for its short in its report. Other well-funded Ethereum competitors like EOS, Dfinity and Tezos have recently come online or are planning to launch later this year. “EOS just raised $4 billion, and you can pay teams to build applications,” Sunnarborg says. “I don't think people with big bags [investments] are going to let that die. ”Tetras also thinks the ICO boom has driven ether’s price up, since many ICOs accepted only ether from interested investors. Those ICOs are at risk of a regulatory crackdown, “which will dry up most of ETH demand,” the report predicts.Sunnarborg believes ether would need to become a better store-of-value asset to live up to its valuation. He sees bitcoin as the more likely winner as the top store-of-value crypto asset, due to “crucial characteristics, including: security, political and architectural centralization, monetary supply, regulation, and liquidity,” he says. Or if a regulatory ruling gave Ethereum a competitive advantage—for example, if other platforms like NEO or Dfinity were classified as securities—he would rethink the position. He doesn’t see the SEC’s recent statement that Ethereum isn’t a security as an indicator of a competitive advantage, because the ICOs that launched on top of Ethereum are still at risk of being deemed securities. Francisco Gimeno - BC Analyst Speculators talking about inflated Ethereum price, lack of scalability solutions yet, new competitors like EOS, Tezos, the SEC and ICOs saga are not helping Ethereum. We have to wait yet for the new competitors which if they are true to what they promise (e.g. Tezos' formal verification), they could make it to get a more real valuation in the market. The German-based Banking-as-a-Platform (BaaP) institution, Solarisbank proclaimed a launch of a new banking service plan that will majorly concentrate on customers from the digital currency and blockchain industry. The newly depicted resource known as "Blockchain Factory" will provide financial management services to all willing companies whose business activities deal indirectly and directly with blockchain tech and crypto solutions. As Cryptocurrency gains more popularity, fewer companies such as brokerage services and exchanges have experienced many issues with their banking providers. Some financial management services and banks have stopped their partnerships with the majority of crypto exchanges and some have terminated business accounts making it extremely hard for blockchain firms to institute dependable banking partners. Solarisbank, the German financial technology company focuses to provide a great service dubbed "Blockchain Factory" which will make all platforms that deal with cryptos to have a perfect banking colleague who is well conversant with the technology. Solarisbank will mainly use Blockchain Factory to provide banking services to all willing companies whose business ventures are indirectly or directly associated with blockchain tech and cryptos such as "Blockchain Company Account" for the banking activity of blockchain firms. 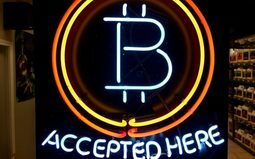 "Furthermore, services for global cryptocurrency marketplaces will be made available to make it easier to buy and sell fiat currencies; such as the Solarisbank 'Automated Trust Account,' an automated escrow account for cryptocurrency marketplace," Solarisbank said. Since the inception in March 2016, Solarisbank has performed excellently and entered a generalship, strategic partnership with Mastercard in October the same year with aim of creating new banking modules. In March 2017, Solarisbank managed to raise US $70 million in a series B financing round from platforms like SBI Group, BBVA, Visa, Lakestar and ABN Amro. "There is high demand from the blockchain world for a licensed partner that forms the technological and regulatory bridge to traditional banking - as a technology company with a banking license, we are the natural partner," Roland Folz, CEO of Solarisbank said. Solarisbank has begun its first official business partnership with another enterprise known as VPE Bank and this partner plans to offer cryptos to institutional traders. Furthermore, the firm will set up strong partnerships with crypto platforms that deal with debit and banking cards around their business model. Peter Grosskopf, CTO of Solarisbank, explained that the fiat world is not about to burn up, the firm is going forward towards a hybrid future that still needs the blockchain world to prove itself, though the disruptive power of these business models is still seen, and that the BaaP institution wants to participate in shaping the future of blockchain and crypto industry. Francisco Gimeno - BC Analyst Banking is very ambivalent in respect to cryptos and blockchain. The accept blockchain and they develop platforms. But blockchain based companies find very difficult to open bank accounts to develop their programs, and more if crypto transactions are also done. This initiative is one of the first which is going, if successful, to take the banking system on the wrong foot, shaping the future of this sector in the new 4IR. Lloyd Blankfein, the CEO of Goldman Sachs, one of the biggest investment banks in the global finance sector valued at $87 billion, has criticized skeptics that believe Bitcoin and cryptocurrency do not have a future. Previously, during an interview with CNBC’s Kayla Tausche, Blankfein echoed a similar sentiment regarding Bitcoin, describing a period in the US history during which the US government abruptly abolished the gold standard and replaced it with a currency with no value, the US dollar. At the time, US-based businesses, individuals, and investors had difficulty accepting and embracing the US dollar, a form of paper money, as an alternative to gold, which has been the standard of money for centuries. 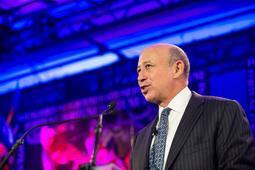 Similar to how paper money was forced to become the natural progression from gold, Blankfein explained that Bitcoin could one day become the natural progression from fiat money to digital money, and thus, although he does not fully understand cryptocurrency and is not convinced that Bitcoin will soon become a reserve currency, Blankfein said he is open-minded about the cryptocurrency market as an emerging asset class. “A five dollar gold coin was worth five dollars because it had five dollars worth of gold in it. Then they issue paper money that is backed by gold in the treasury. Then one day, they issue paper money that does not have the backing of gold. There was no pledge that if you turn it in, I’ll give you five dollars of gold. It is fiat money. I say this piece of paper is worth five dollars and so therefore it is five dollars and a lot of people did not take that for a long time. But, now they do without question. You move a little bit further and you get bitcoin that is not a fiat currency so I don’t trust, it and I don’t like it. On the other hand, if it works, I say maybe it was a natural progression from hard money to digital money, said Blankfein. 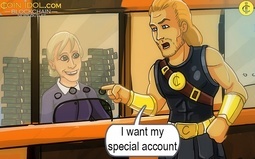 Earlier this week, for the first time in the bank’s history, Goldman Sachs chief operating officer David Solomon confirmed the rumors that Goldman Sachs has been working to establish a cryptocurrency trading desk beyond futures. Apart from clearing Bitcoin futures, Solomon said that the bank has been very cautiously testing cryptocurrency trading and launching a proper cryptocurrency trading desk for its clients in the near future.“We are listening to our clients and trying to help our clients as they’re exploring those things too,” said Solomon. Francisco Gimeno - BC Analyst Goldman Sachs has seen from the beginning where to stand on Blockchain and crypto. Even in volatile times like now with SEC regulations, prices uncertainty and FUD news getting good signs from those who know is very important. The market needs yet to stabilise but the future is good. Mike Novogratz, a billionaire investor and former Goldman Sachs and Fortress trader, told Erik Schatzker at the Bloomberg Invest Summit in New York that the cryptocurrency market is moving to the $20 trillion region. During the interview, which was focused on the economics of the cryptocurrency market, Novogratz was asked by Schatzker about the criticism from skeptics regarding the rapid movement of the valuation of the cryptocurrency market and the bubble-like trend of bitcoin in early 2018. In response, Novogratz stated that if the January bull rally of bitcoin, Ethereum, and other cryptocurrencies is considered as a bubble, it can be described as the 1996 dot com bubble which occurred prior to the 1999 bubble that led the dot com bubble to reach a valuation of $6 trillion before it crashed to $1 trillion. Eventually, Novogratz stated that the cryptocurrency market will rebound from its major correction in mid-2018 and surpass previous all-time highs to reach a $20 trillion market valuation. At its peak, the cryptocurrency market was valued at around $900 billion. A $20 trillion valuation would require a 20-fold increase from its previous all-time high. “[Cryptocurrency] is a global revolution. The internet bubble was only a US thing. It was rich US people participating. [Cryptocurrency] is global. There are kids in Bangladesh buying coins. It is monstrous in Tokyo, in South Korea, in China, in India, and in Russia. We’ve got a global market and a global mania. This will feel like a bubble when we’re at $20 trillion,” said Novogratz. While Novogratz is often considered as an optimist and a bull investor in the cryptocurrency sector, he has offered evaluation of the cryptocurrency market based on real indicators, statistics, and realistic overview of the industry. Novogratz emphasized that despite the growing demand from institutional investors for cryptocurrencies, actual investments that have come in from institutional investors have virtually been non-existent, and the most recent bull rally was triggered by retail investors or individual traders. Many experts including Blocktower founder Ari Paul have noted in the past that the entrance of institutional investors would require stable and robust custodian solutions. Given that many cryptocurrency businesses including Coinbase and conglomerates in the traditional finance sector such as Susquehanna have already started to build custodian solutions, it is likely that institutional investors will enter the market in the mid-term. “It won’t go there ($20 trillion) right away. What is going to happen is, one of these intrepid pension funds, somebody who is a market leader, is going to say, you know what? We’ve got custody, Goldman Sachs is involved, Bloomberg has an index I can track my performance against, and they’re going to buy. And all of the sudden, the second guy buys. The same FOMO that you saw in retail [will be demonstrated by institutional investors],” explained Novogratz. Dean Louis I think he's totally right, the big players haven't even entered the game yet and up until now it's been Joe Blogs and Granny Smith and unknown individuals that were hoping to make a few dollars, like buying lottery tickets and the buzz from people who did make a pretty penny just encouraged it. When the real players enter the market though, it's going to be a whole different ball game and things are going to get real! Real BIG, real fast! We're on the precipice of the biggest history making event of our time and if we look away for a second, we'll miss it and those that miss it will shrivel up and die, blowing away like tumble weed! Francisco Gimeno - BC Analyst Cryptocurrency sector can appear to be already huge but in reality is just a baby compared to the traditional financial markets. This is going to change in very few years, when institutional investors and a wider expansion of digital economy happens. Novogratz is not exaggerating. 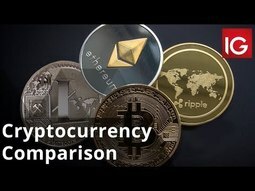 It’s cryptocurrency vs cryptocurrency, as we compare bitcoin, ether (ethereum), litecoin and ripple against each other. Francisco Gimeno - BC Analyst If you are new to Cryptocurrencies, these two minutes will help you to understand a little better what is the issue with the four more important cryptos at the moment. Bitcoin, the world’s biggest digital currency, fell through $8,000 late Tuesday and the slide has not abated. Bitcoin tumbled to a multiweek low of $7,442.92. Bounces have been limited, with a single coin last worth $7,528.89, down 7.1% from late Tuesday Eastern U.S. levels on the Kraken exchange. The collapse in cryptocurrencies has seen the total value of all coins fall to $326 billion, down some $50 billion in just 72 hours, according to Coinmarketcap. Bitcoin enthusiasts looking for the next support line might be better off tracking current resistance levels, according to one analyst, who says we are still in a trend, and it’s not higher.“Last week’s $9k support has turned into this week’s $8k support. And thus far it is giving every indication that $7k will become next week’s support. I hope you see the trend here,” wrote Jani Ziedins in a blog post.“It takes most bubbles between six and 24 months to finish bursting. If bitcoin is like most bubbles, that means the worst is still ahead of us and we should expect lower lows over the next few months. 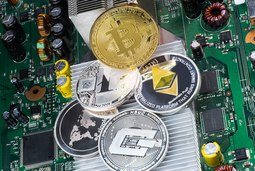 Altcoins, or digital currencies other than bitcoin, are showing hefty losses early Wednesday.Ether ETHUSD, -0.72% has lost 10.6% to $586.00, Litecoin LTCUSD, -0.12% is down 8.2% at $119.10 and Ripple’s XRP coin XRPUSD, -0.13% is down 10%, last trading at 59 cents.Bitcoin Cash BCHUSD, -0.39% is the biggest loser, currently down 12%, trading below $1,000 at $991.30. Bitcoin Cash reached a low of $969.20 Wednesday, a fall of 15.8% on the day. At this rate Bitcoin Cash, which had risen more than 100% in April, is on track for its third consecutive weekly loss. Futures finished the day well in the red. The Cboe June contract XBTM8, -0.95% finished down 6.6% at $7,647.50, while the CME May contract BTCK8, -0.59% closed off 7.2% at $7,590. Francisco Gimeno - BC Analyst One or two weeks ago everyone was talking about a bullish market and Consensus conference. Now the market is trending on low and not moving at all up. Do we believe the ones who say the bubble is yet bursting and have to expect lower prices? Those who boldly state that prices will go up very soon? What do you think? Ran Neu Ner, ONchain Capital Founder, discusses regulation and the impact it could have on cryptocurrencies. Should investors buy in here? About CNBC: From 'Wall Street' to 'Main Street' to award winning original documentaries and Reality TV series, CNBC has you covered. Experience special sneak peeks of your favorite shows, exclusive video and more. Francisco Gimeno - BC Analyst While SEC is mulling regulations, the Blockchain and crypto industry continues working and developing, albeit in a slower way, in the USA environment. Listen to what Ran New New has to say about what he thinks about which cryptos are going up or not and more issues. Do you agree with him? Some of his analysis are very interesting (even shocking!). Then, do your homework and don't invest what you can't afford to loose! The blockchain economy is imminent, in one form or another. Little doubt remains that we will eventually move toward a world in which most of our transactions will be processed on the blockchain, and we will, over time, use cryptocurrency for our daily transactions. What remains to be seen is whether bitcoin or a competitor will be that cryptocurrency. Bitcoin BTCUSD, -0.49% has a formidable first-mover advantage. Yet history has shown repeatedly that ‘me-too’ technology can improve on and dominate the first mover. Recall Webvan, which, despite having a valuation of almost $5 billion in 2001, failed to deliver on the promise of online grocery, paving the way for Instacart and others. Similarly, Myspace, one of the first social-media platforms, was eventually dominated by Facebook and other later arrivals. What went wrong for Webvan is illustrative of one road bitcoin could take. Webvan’s high valuations prompted higher expectations that led to excessive expansion and subsequent collapse. Similarly, a per-coin valuation that recently peaked at nearly $19,000 and cheerleaders like the Winklevoss twins projecting a target of more than $320,000 have created unrealistic expectations for bitcoin. Given the current state of the technology, bitcoin’s current price of around $7,000 — although still high compared to most of its history — is a relative disappointment. And this disappointment could lead to the demise of bitcoin. In all competitive markets, the price at which a product is sold depends on the cost to manufacture it. A product can be priced at a premium only if it requires specialized knowledge or intellectual property that prevents other market participants from manufacturing and selling an identical product. For example, you may have a brand that others cannot replicate or a patent without which the product cannot be manufactured. As a commodity, no such thing exists for manufacturing bitcoin and other mineable cryptoassets — with limited technical knowledge, anyone can mine bitcoins. Thus, the price of bitcoin must be close to the fully loaded cost of mining it (meaning you are modestly compensated for your time and capital outlay). Of course, underpinning the equilibrium value is an assumption that there is a use case for bitcoin, the value of which exceeds the cost of mining it. The recent meteoric rise in bitcoin’s price attracted investors who were bound to be disappointed, because the price of bitcoin had far exceeded the cost of mining it. Not surprisingly, the investors who bought at these high prices had losses. But more importantly, the price spike also impacted the composition of bitcoin miners. The high prices attracted miners who realized that they could make arbitrage profits by mining and selling bitcoin in the futures market. With prices declining, these opportunistic miners are moving away from bitcoin.The cost of making bitcoin is not a fixed-dollar amount; there is a feedback mechanism in mining any commodity. As the price of bitcoin increases, new entrants who want to mine bitcoin enter the market, increasing the effort required to mine a bitcoin, as its reward will be shared among a larger group of miners. Similarly, when the price of bitcoin falls and miners exit, the cost of mining decreases. However, the number of miners cannot fall below a certain level, because without the miners providing the computing power to maintain the ledger, the bitcoin blockchain will not remain viable. If the price of bitcoin falls below its cost of mining, it will quickly go to zero. The real concern is that if the price of bitcoin continues to fall, mining will become infeasible, and without enough participants providing the computing power to record the transactions, the transactions will be infeasible and bitcoin will become worthless.The proponents of bitcoin would argue that we have seen large percentage declines in bitcoin prices before. Miners were providing the computing power when the price of bitcoin was in triple (or double) digits. But that was a different world — the participants in the bitcoin market were idealists and more interested in changing the world than making a fast buck — and they believed a decentralized monetary system based on bitcoin would enable them to get there. But the rapid increase in its value prompted traditional investors focused solely on their returns to enter the market. These investors were enabled by the exchanges, which improved the price discovery and liquidity by listing derivatives. • The bitcoin futures markets XBTJ8, +2.66% BTCJ8, +2.73% did not exist before, and these markets allow miners to estimate their mining losses and profits at the outset. If I can buy in a futures market at a price below my mining costs, why would I ever mine for a sure loss? Bitcoin’s recent decline may signify the beginning of a death spiral — if the price of bitcoin falls below its cost of mining, it will quickly go to zero. The blockchain technology is here to stay, but an improved coin might evolve, or governments might start issuing cryptocurrencies — in which case, bitcoin could become a victim of its own success. Atulya Sarin is a professor of finance at Santa Clara University. He has written on currencies in his book “Foundations of Multinational Financial Management” (sixth edition) and has worked extensively as a valuation expert. Francisco Gimeno - BC Analyst Good reflection on how a death spiral on prices for Bitcoin could happen, and be a victim of its own success, even when the Blockchain and crypto economy is here to stay. However, Bitcoin has a lot of surprises for us yet. What do you think? Cryptocurrency prices gave up some recent gains Wednesday, with bitcoin, the No. 1 digital currency, drifting back below $7,000 as bullish traders hold their breath. The swings in crypto prices over the past week have been indicative of the wider market, marked by listless, directionless trade. “The market remains topsy-turvy and people aren’t sure what lies ahead,” said Charles Hayter, co-founder of CryptoCompare. “Last year we went from irrational exuberance where people were riding the trend higher, to a shift lower this year. Essentially we have gone from higher highs to lower lows.”Adding to the slide were concerns after U.S.-based cryptocurrency exchange Kraken suffered a systems failure. Exchange failures continue to weigh on the market-validity debate. Kraken Support@krakensupportWe are currently experiencing issues across all funding methods. Please expect crypto and fiat deposits to be delayed until we identify and resolve the issue. Bitcoin BTCUSD, -3.13% last changed hands at $6,876.19, down 7.3% on the day. Read: Why is blockchain-of-choice Ethereum underperforming crypto rivals? The debate remains whether the failure at the “death cross,” where the 50-day moving average crossed below the 200-day moving average Monday, was a medium-term low. But one analyst said it was just a function of the “grossly oversold levels” and not a shift in sentiment. “Expect prices to undercut February's lows over the next few weeks and that violation to trigger a large wave of defensive selling,” said Jani Ziedins of Cracked Market in a Tuesday blog.“Don’t expect prices to bounce until we fall into the $4k range. Then and only then will it be safe to buy the bounce,” he said. 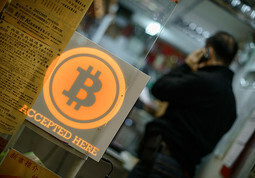 The decline in bitcoin has weighed on the digital-currency industry. After pushing above $400 yesterday, ether fell 7.8%, to $377.53; bitcoin cash was off 8.1% at $654.65; Litecoin last traded at $120.64, down 10.2%; and Ripple was down 7.5%, at 50 cents. Futures markets ended the day well in the red. The Cboe’s April contract XBTJ8, -3.92% settled Thursday down 7.9% at $6,890, and the CME Group Inc.
Francisco Gimeno - BC Analyst Two weeks ago someone predicted a Bitcoin on $3000, today we read at least $4000 before bouncing. The trend sounds bearish indeed for this month, as there is uncertainty in the markets yet. However, as usual, before investing, buying or selling, let´s do the proper homework and due diligence. 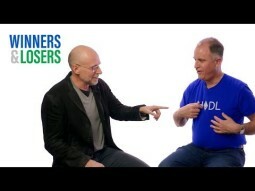 Scott's deep dive into cryptocurrency, blockchain and initial coin offerings with NYU Stern finance professor David Yermack. 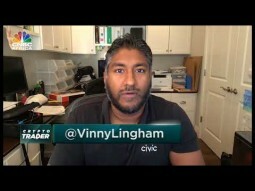 This video and breaking news events in blockchain and dynamic cryptocurrency markets reporting, is also streaming on BCtv, BlockchainTelevision.org for larger screen devices. For a better viewing experience, Click here now to start watching in your browser. It's free 24/7 continuous streaming on autoplay. BCtv is made for higher impact. Switch it on! In your desktop, laptop, xBox and Smart ConnectedTV. Francisco Gimeno - BC Analyst Good talk about cryptocurrency trade evolution since #crypto futures were started until the half last of March. Close to 27 minutes of common sense and reflections. What do you think about his opinions? Write your comments. Strongly Suggested Viewing! 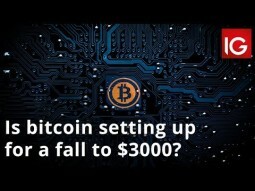 Is bitcoin setting up for a fall to $3000? With technical analysis supporting a further drop in the current price action for bitcoin, Ron William, from RW Advisory, suggests the cryptocurrency could hit $3000. 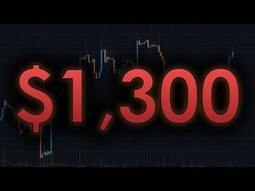 Ron also discusses falls for ethereum, ripple and litecoin, before a recovery. 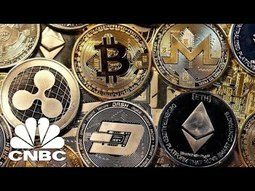 This video and breaking news in blockchain and cryptocurrency markets is showing now on BCtv. Click here to start viewing in your browser, all on 24/7 autoplay! For larger device screens only. Watch on your desktop, laptop and connected smart tv while you work. Francisco Gimeno - BC Analyst During the last weeks we have read or watched in BC website very different opinions on Bitcoin, everybody giving serious and reasonable reasons on why Bitcoin should be leading now to the skies or like in this case maybe is setting up for a fall to $3,000. If classical Forex is already a difficult discipline, surely investment in crypto will be even more difficult as the classical tools used for analysis of the forex market maybe are not what the crypto market needs. As in the Admin comment, the only common sense advice is to do proper due diligence and get informed (use this website to get the best info!). Admin Blockchain Company As you probably know, Pigs get slaughtered on Wall Street for being on the wrong side of the markets. On the Cryptocurrency Markets, the logic is even worse, in an environment full of scams, fraudsters and imposters. If you don't want to end up a pig, do your due diligence and follow quality curated content on BlockchainCompany.info. We are just getting started. We are quietly building blockchain applications and cryptocurrencies you are going to love. Create a free account on BC today.